The best re-issue this year by a classic UK act you’ve never heard of. 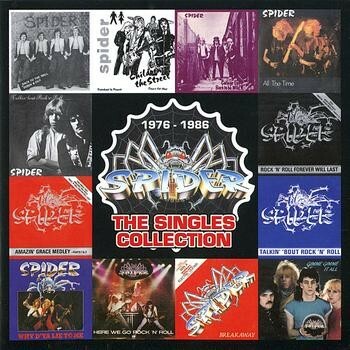 A favourite act of mine as I was growing up, to say that Spider are one of the forgotten UK rock outfits of the 70’s and 80’s would be a bit of an understatement. Thankfully reissue specialists Lemon Records know who Spider (not to be confused by a US act of the same name) were and have seen fit to release this excellent two disc collection comprising every A and B side (including 12 inch-only tracks) the band released, complete with excellent artwork and a liner essay courtesy of legendary rock and metal scribe Dave Ling. Formed in 1976, Spider were the brothers Burrows - Brian (vocals/bass) and Rob E. (drums), alongside guitarists Col Harkness and Dave “Sniffa” Bryce. Flipping from label to label while releasing singles that initially relied on 70’s Glam Rock for inspiration, the likes of ‘Back To The Wall’, ‘Children Of The Street’ and ‘College Luv’ all see the four piece finding their feet and searching for a distinctive sound. With a debut album scheduled through Creole Records, Spider then released the singles ‘All The Time’ and ‘Talkin’ ‘Bout Rock ‘N’ Roll’, which brought a more focused heads down boogie to the fore - with a rocked up Status Quo vibe coming through as a strong influence. With that more distinguishable sound established, RCA Records stepped in to release the band’s first album ‘Rock ‘N’ Gypsies’ in 1982, from which three singles were released, the stand-out being ‘Rock ‘N’ Roll Will Last Forever’, which was backed by Spider’s signature medley ‘Amazin’ Grace’, which contains snippets of Sabbaths’ ‘Paranoid’, Quo’s ‘Rain’ and Skynyrd’s ‘Freebird’ among many others and was a song that proved to be a huge hit live. By this time Spider had spent literally months on the road, with those hours honing their stage craft transferring into a band who sounded tight and powerful. Harkness and Sniffa fire out cracking riffs, the brothers Burrows became a sensational rhythm unit and Brian’s gritty vocals, were perfect for the heavy boogie rock the band favoured. 1984 was a turning point for Spider with A&M releasing their strongest album ‘Rough Justice’, with the single ‘Here We Go’ and the flip-side ‘Death Row’ adding a glossy sheen to the earthy guitars to great effect. A fantastic stand alone single ‘Breakaway’ followed, with a more commercial sound (imagine early FM mixed with Showaddywaddy – I know it sounds wrong, but believe me it worked amazingly well), but failed to make inroads into the charts- and with that, the band’s major label days were over. A final album ‘Raise The Banner (For Rock ‘N’ Roll)’ followed in ‘86, but was largely ignored, which when considering the quality of its solitary single ‘Gimme Gimme It All’, was a real travesty, and led to the band calling it a day. Excellently re-mastered and coming with a cracking booklet, Spider’s ‘Single Collection’ may well be the best album reissued this year by a classic UK act you’ve never heard of.